Celebrating Laue – complex structures very quickly! 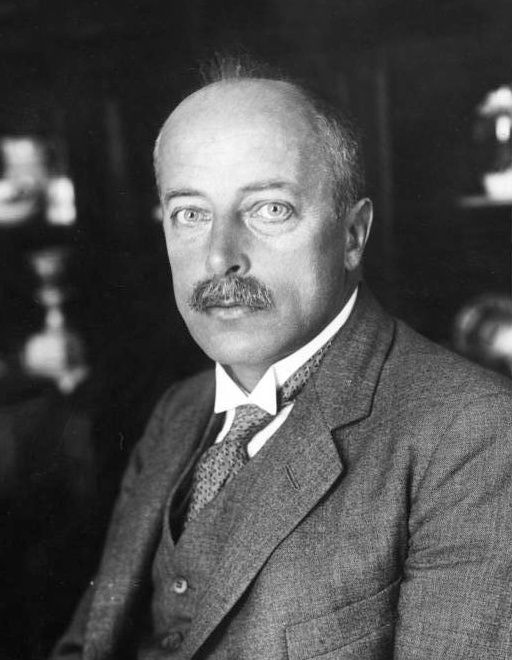 In a slight oversight at crystallography 365 HQ, we missed that it was Max von Laue’s birthday on Thursday. Von Laue received the Nobel prize for physics in 1914 for his discovery of the diffraction of x-rays by crystals, the first crucial step to the science of crystallography as it is today. Though von Laue went on to concentrate on theoretical physics, one particular technique of diffraction is named after him – Laue diffraction. With this technique of diffraction the sample is kept still and the x-rays it is exposed to are polychromatic – they occur in a range of wavelengths. 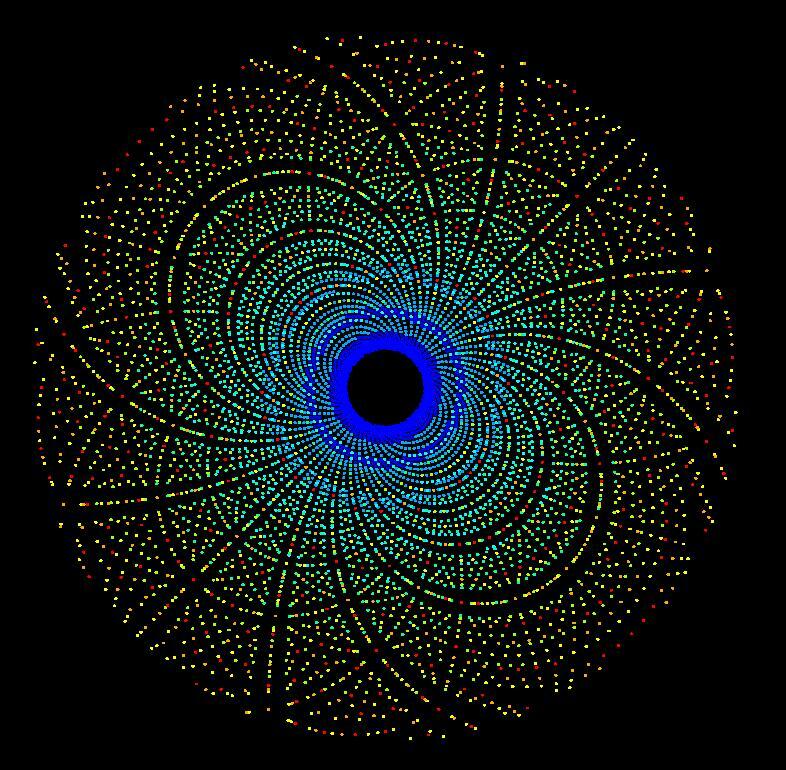 This means that lots of planes of atoms satisfy the Bragg condition at once, and makes for some very pretty pictures. Laue diffraction is particularly useful for a number branches of crystallography – and over the next few days we’ll be featuring a few of them. Today we’ll introduce one use – taking rapid data! As you can see this is a pretty complex arrangement of atoms, it’s a complex of the metal rhodium in a state that only exists for a few seconds at a time. 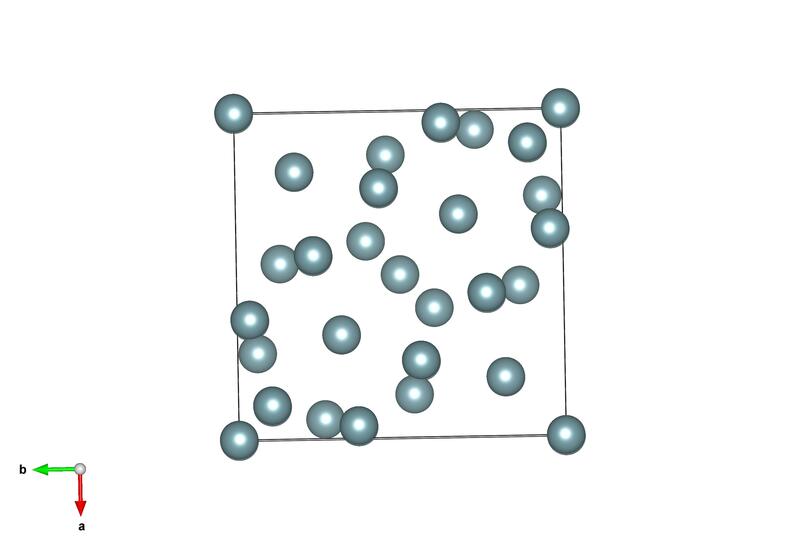 The advantage of Laue diffraction, is that if you can push the material into its excited state as well as hitting it with a pulse of x-rays – you can find even the most fleeting of crystal structures. This is structure came from work by Makal et al. 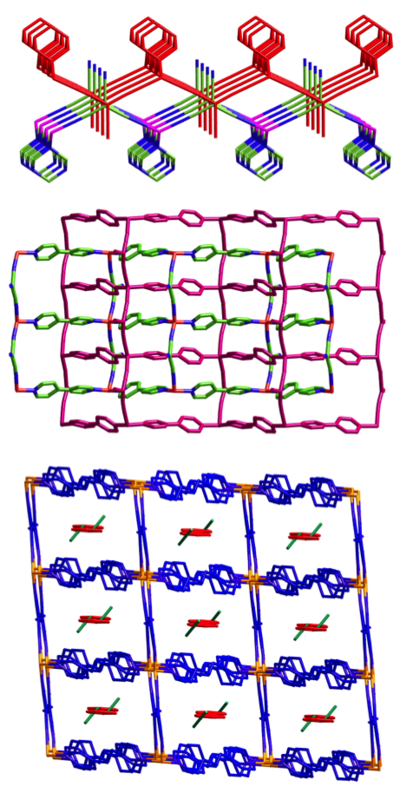 and is #2019360 in the open crystallographic database. What is does it look like? The atomic resolution structure of the large ribosomal subunit at 2.4 Å Resolution (PDB ID 1FFK, Ban et al., Science, 2000). 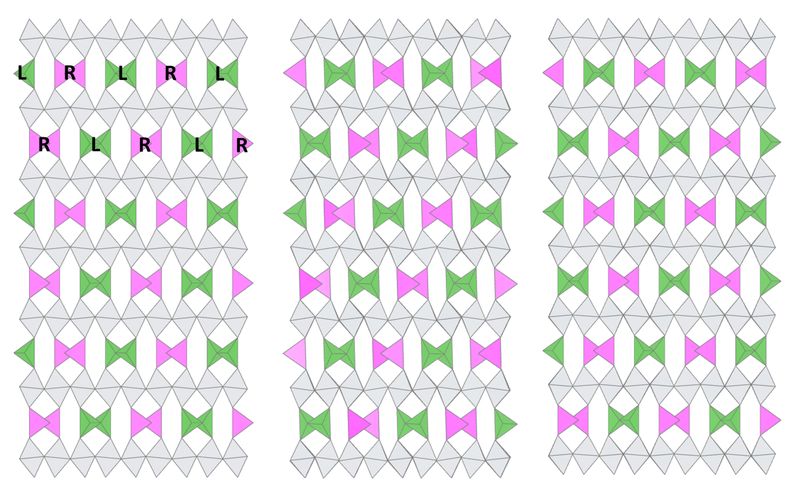 Shown in grey are the RNA molecules of the ribosomal subunit, and ribosomal proteins are shown in different colours. 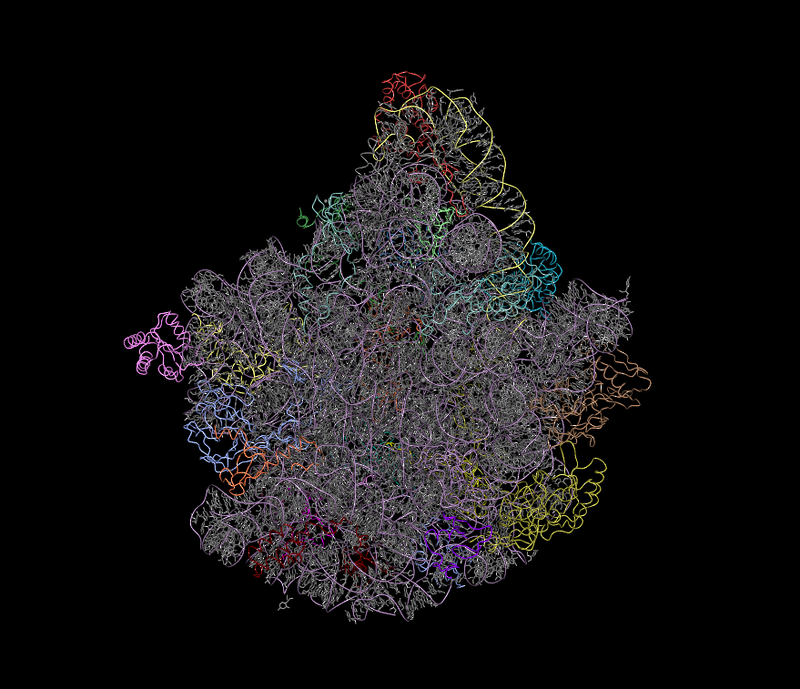 The ribosome is the complex molecular machine that is found in all living cells. Peptide-bond formation and protein synthesis by the ribosome, is essential to all life on earth. Ribsomes of every species are composed of two unequally sized subunits named, imaginatively, the large and small subunits. In 2000 the structure of ribosomal subunits were finally revealed at atomic resolution through crystal structures determined in the labs of Ada Yonath, Tom Steitz and Venki Ramakrishnan. This work and work from others in the intervening years have pushed the envelope of crystal structure determination of enormous biological macromolecular complexes. It remains one of the largest structures of an asymmetric macromolecule determined to date. The structure shown here is the original 2.4 Å resolution structure of the large ribosomal subunit from Haloarcula marismortui, which catalyzes peptide bond formation and binds initiation, termination, and elongation factors. It includes 2833 of the subunit’s 3045 nucleotides and 27 of its 31 proteins. The domains of its RNAs all have irregular shapes and fit together in the ribosome like the pieces of a three-dimensional jigsaw puzzle to form a large, monolithic structure. Most of the proteins stabilize the structure by interacting with several RNA domains, often using idiosyncratically folded extensions that reach into the subunit’s interior. Where did the structure come from? This structure was determined by the lab of Tom Steitz. You can view it at http://www.rcsb.org/pdb/explore.do?structureId=1ffk and read more about it in http://www.sciencemag.org/content/289/5481/905.long. Movie made with CDC’s Mercury which then generated Povray file and was edited to give some further detail. Jason published his structure here.